alaTest has collected and analyzed 407 reviews of Sony BDP-S6700. The average rating for this product is 4.5/5, compared to an average rating of 4.6/5 for other products in the same category for all reviews. People are impressed by the reliability and design. The price and size also get good feedback. We analyzed user and expert ratings, product age and more factors. 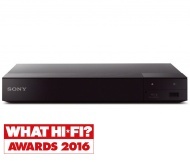 Compared to other products in the same category the Sony BDP-S6700 is awarded an overall alaScore™ of 93/100 = Excellent quality. This player has more downloadable apps than others. It doesn’t support Ultra-HD discs. THIS BLU RAY PLAYER MATCHED WITH MY XF90 4K TV IS A WINNING COMBINATION......JUST AWESOME. A lot of features in a small package ' receives wifi signal much better than my tv and so streams inbuilt apps more efficiently, not used the 3d option but reproduces good pictures from both blu ray and dvd. Generally pleased, but some disappointment to. All mostly well with this Blu Ray DVD player. Choose it since it plays most DVD formats (eg DVD+R &DVD -R etc), but be aware that apparently will not play DVD+R unless recording is finalised. So much for some of my old family video recordings then!